mysterious and malevolent creature known as the Bossman has seized Lily and pulled her into the swamp and through the proverbial looking glass. The bayou that borders the community of Charon contains a gateway capable of transporting people to a fantastical world—like the boatman that serves as the town’s namesake. Charon is a place populated by anthropomorphized versions of Br’er Rabbit, Br’er Bear, the Tar Baby, Cotton Eyed Joe and other fantastic creatures derived from African American and Southern folklore. Guided by her guardian angel Billy Glass—a young boy from Charon who was reincarnated after he was lynched for whistling at a white girl—and aided by the shambling figure known only as Bayou, Lee fearlessly journeys into the Bossman’s realm to rescue Lily before it’s too late! While the above synopsis captures the central elements of Bayou’s plot, it fails to elucidate the ludic charm of Love’s approach. 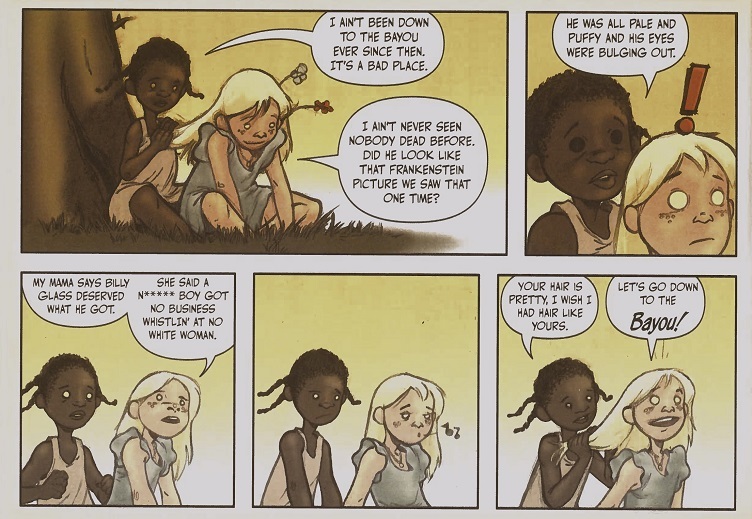 He playfully alludes to literary work from disparate sources and challenges derogatory conflations of blackness and animality by upending the comic book motif of “funny animal” characters.1 Love also contests the racial conventions of children’s literature by granting a vulnerable black girl, Lee, with the pluck and resourcefulness that Twain permitted Huck Finn. What is more, Love redeems the tragedy of Emmett Till by crafting an analogue—Billy Glass—that demonstrates the cost of society’s refusal to grant black children innocence in order to resist the monstrous white supremacy that condemns them.2 Indeed, with an illustrative style that alludes to George Herriman’s Krazy Kat, Walt Kelly’s Pogo, Bill Watterson’s Calvin and Hobbes and the portraiture of Charles White and Kerry James Marshall, Love depicts the traumas of racism as diminishing its perpetrators and ennobling its victims. Love’s attempt to mythologize and therefore transform the daily trauma that shaped black life in the Jim Crow South distinguishes his narrative even as the contours of that trauma define not only life in Charon, Mississippi but also in the crazy-quilt fantasyland that has lured both Lily and Lee into its environs. Though Lee and her widowed father might subsist precariously as sharecroppers, their potential proscribed by the toxic social codes of an unreconstructed Mississippi, those same limitations instill in Lee the resilience she will need to rescue Lily and free her father. Lee must navigate Lily’s ‘innocent’ cruelty about racial terror. The second image, from the interior of book one of Bayou, confirms the premise of the promotional image by illustrating the exploitative nature of Lily’s “friendship” with Lee. Lee and Lily discuss the fate of Billy Glass, which is an attempt on Lee’s part to process the trauma of discovering his body. When Lee describes Billy’s ravaged body, Lily demonstrates how white supremacy constrains empathy and understanding by blithely repeating her mother’s admonition which sanctions his lynching. Lily’s callousness stops Lee cold, and she tries to repair the rupture in the conversation by complimenting Lily on her hair. The fourth panel on the page, silent except for Lily’s whistling, communicates Lee’s dismay by contrasting the sunny yellow background with Lee’s slumped shoulders and downturned mouth. Lily’s next statement reinforces her lack of compassion as she insists that they go down to the Bayou, which Lee identifies as “a bad place.” Lily’s aimless whistle and refusal to credit the dangers Lee identifies demonstrate how the naïveté permitted by white supremacy tempers Lee even as it makes Lily vulnerable. The pastels that Love uses in both images—sky blues and cornstarch yellows—contrast nicely with the blacks and browns that link crow and tree to vulnerable black bodies. Lee leans against a tree as she plays in Lily’s blonde hair, the brown bark calling attention to her once white but now dingy shift. Of course, the same tree that shelters her might also provide support for a hangman’s noose. In the images above, Love grants both trees and black bodies a similar visual resonance, rendering both with earthen browns and parallel hatching that suggest that evil has taken root in the land. In Bayou, swamps, swimming holes, and even trees teem with menace because the violence of white supremacy infects the very landscape. Love disrupts the belief system that makes nature feel unsafe and that destroys the innocence of children like Lee Wagstaff by making them responsible for the safety of black masculinity and the preservation of white femininity. By collapsing the distance between reality and fantasy, man and animal, childhood and adulthood, innocence and guilt, Love’s Bayou achieves a moral complexity that edifies even as it enchants. These literary sources include Zora Neale Hurston’s Mules and Men (1935), Charles Chesnutt’s The Conjure Woman (1899), Harriet Beecher Stowe’s Uncle Tom’s Cabin (1852), Frank Baum’s Land of Oz series (1900-19), and the setting this story in a fictionalized Mississippi locale during Jim Crow as thoroughly realized as William Faulkner’s Yoknapatawpha County. Funny animal comics—think Daffy Duck and Bugs Bunny—are a popular genre in the form, one subverted in recent years by creations like the Teenage Mutant Ninja Turtles, which combines conventions from anime (e.g. Lone Wolf and Cub), superhero comics (Marvel’s X-Men), and funny animal comics. Love’s compassionate reimagining of Till as defiantly alive helps make the shortcomings of Dana Schutz’s Open Casket with her cynical use of Till clear. Her painting contains none of the verve and invention that typically animates her work. Indeed, the muddy composition of Schutz’s painting deadens Till’s legacy. 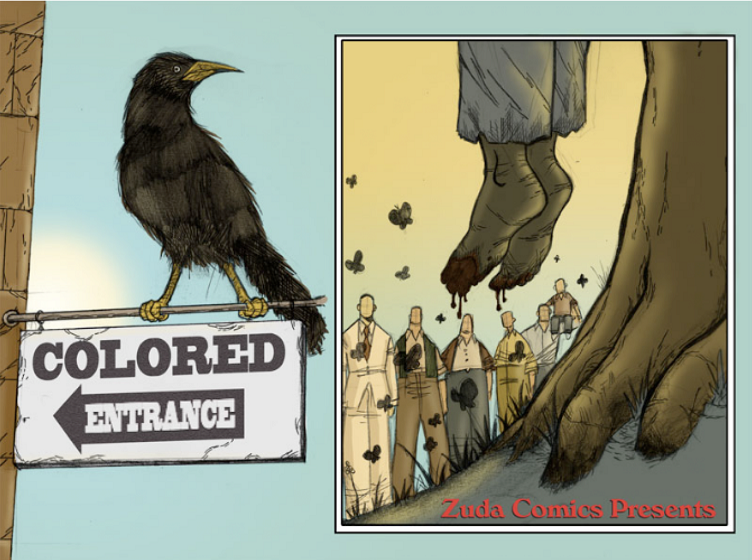 The text, “Zuda Comics presents” identifies the publisher, a subsidiary of DC Comics, that initially distributed Love’s work. The incongruity here should be clear: the same company that circulates the anodyne adventures of Superman will offer a comic that disputes the raceless logic that the Man of Steel purportedly embodies, one that imagines that “the American Way” might be synonymous with “truth and justice.” After publishing volumes one and two of Bayou, Love has held back his concluding third volume until the creative rights revert back to him. Based on my personal discussions with other scholars it seems like he will reissue the first two sections of this story and the final chapter in 2019. Hopefully the narrative will finally find the audience it deserves. 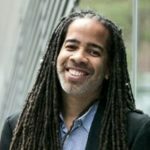 Jonathan W. Gray is Associate Professor of English at John Jay College-CUNY. He is the editor of the Journal of Comics and Culture and the author of Civil Rights in the White Literary Imagination (University Press of Mississippi, 2013). Gray is currently working on the book project Illustrating the Race: Representing Blackness in American Comics which traces depictions of African Americans in comics from 1966 to the present for Columbia University Press. 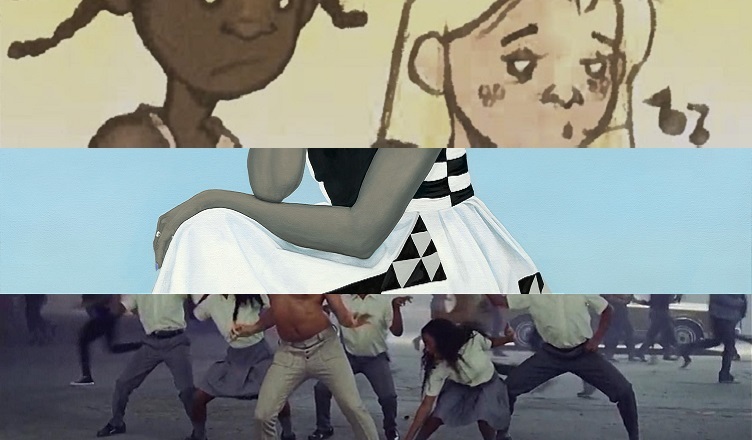 He’s published academic articles on Modernism and the Harlem Renaissance, Kyle Baker’s graphic novel Nat Turner, Jay Z’s relationship to Black masculinity, and Trayvon Martin in popular culture. His journalism on comics and popular culture has appeared at EW.com, Salon.com, and The New Inquiry.